Golden Phoenix is a Chinese restaurant located in Phoenix, Arizona. 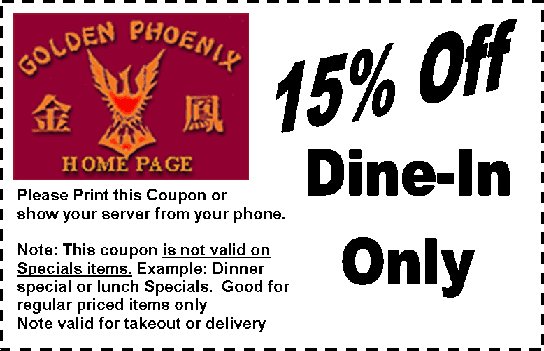 Golden Phoenix restaurant is a classy place to eat authentic Northern Mandarin style Chinese food in Phoenix, AZ. They are providing online orders for take away and for delivery. On this page there are details about this Chinese cuisine including their hours of operation, 15% off coupon to print, phone number for reservations and a map to see directions to the place. Click on the picture to download and print the coupon and get 15% off at Golden Phoenix Chinese restaurant.